With our convenient shuttle service or public transport you can go in and out of the city center easily. Enjoy our beachy party atmosphere and check out some more of the Netherlands! The main area in the Beach hostel is 'the Bar' this is where it all happens. The inviting atmosphere created by our enthusiastic staff is ideal to make new friends. You're always welcome to join in for a home cooked dinner and with the music we play, everything but mainstream, parties are unavoidable. As a real Flying Pig, we also have a nice 'chill out stage' with comfortable rugs and pillows and a significant book collection for everybody to read and swap. 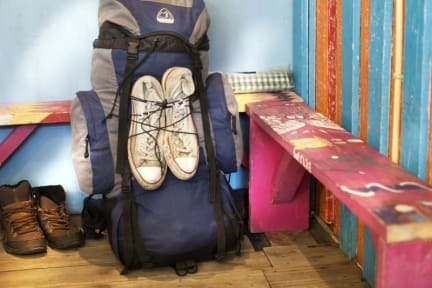 The city of Noordwijk is centrally located in the Netherlands so if you are ready to explore a little bit more than only Amsterdam, The Flying Pig Beach Hostel will be the right spot for you. The Beach Hostel is also the place to come to if you like the following-..
Surfing, kite boarding, body boarding, skate boarding, horse riding, mountain biking and normal biking, 13km golden sand beaches, swimming, beach volleyball, crazy parties, BBq's, dunes, woodlands and flower fields, Sunsets, sand between your toes, bum around, skinny dipping, free internet and cheap beer. The Flying Pig Beach Hostel Terms and Conditions. •People looking for local work opportunities. A booking for over 10 persons is considered a group booking and cannot be booked through our third-party booking agents. This needs to be done via our own website.